The Tsokley Rinpoche Trengwa (or simply Rinchen Trengwa) is the main long Chod ritual practiced by Kagyu and Nyingma lamas and yogis. Those practicing either the Machik or Nyingtik Cho, Drikung Chod, or any of dozens of other terma traditions including the Dudjom Tersar, rely on the Precious Rosary as an extensive Tsok ritual. Others take it as their main practice, doing the full practice daily or focusing on different sections each day. Two such monasteries, strictly devoted to the Rinchen Trengwa, currently exist in Bhutan. The Precious Rosary is also ideal for group or solo retreats of 7, 14 or 30 days or longer. For all however, it is a comprehensive path, containing all the elements of both Chod and Vajrayana. The Precious Rosary of Chod Offerings is the most complete collection of Chod practices we have, directly from the tradition of MaChik herself. The legacy of the Precious Rosary consists of 21 additional texts, including six healing texts, several funerary or after death guidance texts and so on. Rangjung Rigpai Dorje, the Third Karmapa (c. 1300) collated these texts, correcting errors and ensuring that all extant texts were part of the MaChik’s original Chod tradition. Three hundred years later, Karma Chagmé (c. 1650) the famous Kagyu luminary, further polished the collection, preserving an accurate transmission to this day. The Tibetan text or “pecha”, in its current version, contains over 170 folios, while the English transliteration and translation, combined with the Tibetan fills over 300 letter size pages (8.5 x 11″). A unique transliteration system that is easy to pronounce and read for non-Tibetan readers (the majority of students! ), and dramatically different than the ponderous systems used elsewhere. Accurate translations of the meanings of the text, while attending to the lyrical and poetic nature of the original writings as much as possible. Full color text on the right side, with black and white Tibetan on the left, formattted for comparison and language study. Profuse color and black and white illustrations, portrayal of seed syllables, music notations, headings and subheadings, color-coding of the ten sections, oversize page numbering, etc. Hard cover, heavy duty bond paper with lay flat binding and silk bookmark. Each text is individually stamped and numbered. Includes chopen (shrine activity) notations, symbols and directions. Individual singing of the 40 different melodies, accompanied by a narration of the name of each melody in Tibetan and English. This knowledge is now known to only a few lamas a virtually never taught in the West. The full continuous practice, each section as a separate track for convenience of practice and study. The Precious Rosary of Chod is the subject of Module 4 of the School of Tibetan Healing Cho, with comprehensive training in this crucial practice. Though daunting at first appearance, the ritual is actually highly structured and coherent. The three day Live seminar or Distance Learning Program will provide complete training in the performance of all aspects of the Precious Rosary and an understanding of its meaning and practical application as a spiritual and healing pathway. The transmission of the two grand cycles of Machik Chod: The Precious Rosary of Chod Feasts and the Yonten Kunjung (Arisal of All Qualities). Torma training class, or may be learned via the Module 4 DVDs. Introduction to the practice of the Long Cho Feasts: Tsogley Rinchen Trengwa (The Precious Rosary) and Yonten Kanjung (Gathering all Good Qualities). Introduction to torma, and to various specialty practices of healing others. Integrating various Chod practices into daily life. The above hardcover text, number and signed. Detailed color slide handouts, explaining the practice, stage by stage. Video DVD of all important visual parts of the ritual, including mudras, torma offerings, special drum sections and so on. Torma making DVD for the 10 torma types used in the ritual. The Precious Rosary of Chod Feasts is organized into 10 sections. A survey of these sections of the Tibetan text show the full range and depth of this remarkable work. Some of these “sections” were printing separately in old Tibet, indicating that the Third Karmapa (Ranjung Dorje) collected various pieces of MaChik’s direct heritage, to create the seamless work now know as the Rinpoche Tsogley Trengwa. Creation of the field of accumulation, the Higher Guests; extensive Refuge, Bodhicitta and offerings. Alternating praises and feasts, this includes over a dozen different Red and White feast visualizations. The prayers and praises include the Prayer to Padampa by MaChik, the songs of her son to the various doors of her reliquary and many more. The Chod Ganapuja or Tsok, with the feasting of yogis and yoginis, alongside the invited sacred guests of lama, Dakini, Yidam and protector. 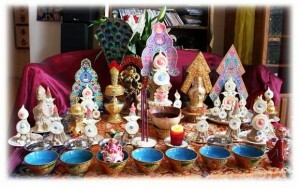 Offerings to the various protectors of Chod, including those bound to service by MaChik and Padampa Sangye. Offering to the various classes of Dakinis, including Exhorting the 100,000 Dakinis, Dakinis of the 25 places and so on. Chenrezig practice, Dedication, Confession, Sending back the Guests, etc.